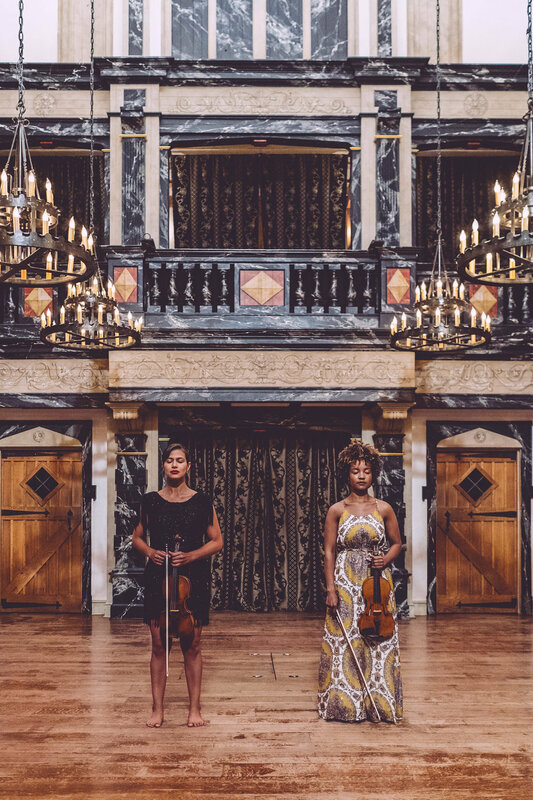 • Melissa's Harlem Quartet performs in London, Toronto, New York, Detroit, Baltimore, St. Paul, Phoenix, and Washington, D.C.
Melissa White and Elena Urioste — violinists, yoginis, and dear friends — spend much of their lives on the road, performing and jet-setting around the world. Melissa White, a first-prize laureate in the Sphinx Competition, has received critical acclaim for solo performances with some of America’s leading ensembles, including the Cleveland Orchestra; the Boston Pops; and the Atlanta, Baltimore, Colorado, Detroit and Pittsburgh symphony orchestras. As a founding member of the award-winning Harlem Quartet, she has appeared in many of the country’s most prestigious venues, including Carnegie Hall, the White House for President Barack Obama and First Lady Michelle Obama, and the Kennedy Center; and internationally in Europe, Africa, Japan, and the U.K., where the ensemble is currently Quartet-in-Residence at the Royal College of Music in London. The musical versatility of Harlem Quartet has also garnered them an international reputation in the world of jazz; following an extensive concert tour with Chick Corea and Gary Burton, the sextet's recording Mozart Goes Dancing won a 2013 Grammy Award for Best Instrumental Composition. Elena Urioste has given acclaimed performances with major orchestras throughout the United States, including the Philadelphia and Cleveland Orchestras; Boston Pops; New York, Los Angeles, and Buffalo Philharmonics; and the Chicago, San Francisco, National, Atlanta, Baltimore, and the Detroit symphony orchestras, among others. Abroad, she has appeared with the London Philharmonic Orchestra, Hallé Orchestra, Philharmonia Orchestra, Orchestra of Opera North, and the BBC Symphony, BBC Philharmonic, and BBC National Orchestra of Wales. She has regularly performed as a featured soloist in Carnegie Hall’s Stern Auditorium and has given recitals in such distinguished venues as the Wigmore Hall in London, Carnegie Hall’s Weill Recital Hall, Konzerthaus Berlin, and the Sage Gateshead in Newcastle. Recent season highlights have included a recital debut at the Kennedy Center with pianist Michael Brown and three separate concerto and chamber music appearances in Carnegie Hall’s Zankel Hall in the 2017/18 season; upcoming highlights include subscription debuts with the Royal Liverpool Philharmonic Orchestra and the Orchestre National de Lille, in addition to the release of Elena’s second album on BIS Records, Estrellita, a collection of miniatures for violin and piano with pianist Tom Poster. Melissa and Elena met in 2003 via a combination of ENCORE School for Strings, the Curtis Institute of Music, and the Sphinx Organization. Through their attendance at and performances in affiliation with all three, the two grew to be wonderful friends and natural collaborators. Unbeknownst to each other, Melissa and Elena stumbled upon their respective yoga practices at exactly the same time in two different cities! Upon discovering each other’s new passion for yoga in the autumn of 2009, they added this to their list of commonalities and began to practice together whenever their schedules allowed. Over the past nine years, the benefits that they have both experienced as a result of a regular yoga practice have been innumerable, from improved muscular control in their violin playing to an increase in self-discipline to a greater sense of peace with the world around them. Both active teachers within their respective musical careers, Melissa and Elena have often found themselves advising students to employ principles learned in yoga as much as those from their musical studies. Their belief that two fields are inextricably linked led to the founding of Intermission Sessions & Retreat. Intermission encompasses a series of workshops for students and retreats for professionals, all of which aim to explore and celebrate the symbiosis between yoga and music. Through yoga, musicians of all ages begin to build greater awareness of their bodies and learn proper alignment to optimize their musical set-ups, practice mental focus and efficiency, and deepen their connections to their inner selves and, ultimately, to music. Intermission is currently offering capsule Sessions, in which Melissa and/or Elena visit schools, festivals, and other musical organizations to work with students of all ages on connecting their minds, bodies, and spirits to their music-making. Groups are guided through light yoga sequences with an emphasis on preparing the body for instrumental practice sessions or performances, including arm and hand stretches to warm and limber the muscles, breathing techniques to relax and center oneself before a nerve-wracking stage appearance, and properly stacking the body from the feet to the crown of the head to achieve optimal posture. These yoga sessions are then supplemented by instrumental masterclasses, where Melissa and Elena teach with an emphasis on applying what students have learned on the yoga mat to their musical studies. An Intermission Retreat is a week-long getaway for seasoned professional musicians to come together in a supportive, peaceful, communal setting to practice yoga, hone their crafts, and share creative ideas — an artist colony meets yoga retreat. Both Sessions and Retreats provide the time, space, and guidance for musicians to begin to connect the individual elements of themselves and their music-making into one complete picture. Intermission Sessions have taken place at the Curtis Institute, Mannes College of Music, Heifetz International Music Institute, Sphinx Performance Academy, Royal Northern College of Music, SphinxConnect, and Chamber Music by the Sea, among other institutions and festivals. This year sees Sessions at the Oberlin Conservatory, Interlochen Academy of the Arts, Tarisio Fine Instruments in New York City, and the Cheltenham Festival in England. Intermission has held three week-long Retreats in Manchester, Vermont, and in 2019 will hold its first international Retreat in the south of France.